The aim of the study was to develop a multiplex assay for rapid detection of mcr-1, mcr-2, and mcr-3, a group of genes of conferring resistance to colistin mediated by plasmid in Enterobacteriaceae. A SYBR Green based real-time PCR assay has been designed to detect the mcr genes, and applied to cultured bacteria, feces and soil samples. All three mcr genes could be detected with a lower limit of 102 cultured bacteria. This test was highly specific and sensitive, and generated no false-positive results. The assay was also conclusive when applied to feces and soil samples containing mcr-1-positive Escherichia coli, which could facilitate the screening of mcr genes not only in the bacteria, but also directly from the environment. This simple, rapid, sensitive, and specific multiplex assay will be useful for rapid screening of the colistin resistance in both clinical medicine and animal husbandry. Colistin is regarded as the last antibiotic for the treatment of infection of Carbapenem Resistant Enterobacteriaceae (CRE). Since the discovery of first plasmid-mediated colistin resistance gene mcr-1 in 2015 (Liu et al., 2016), it has caught worldwide attention. The mcr-1 gene has been widely reported from all major continents, North America, North Africa, Southeast Asia, and Europe (Wang et al., 2017a). Shortly after that, six variants (mcr-1.2 to mcr-1.7; Figure S1) of mcr-1 with one amino acid change have been reported and submitted to GeneBank (https://www.ncbi.nlm.nih.gov/gene). In 2016, a novel colistin resistance gene, mcr-2, was discovered from Belgium with 76.75% identity to mcr-1. Very recently, another novel colistin resistance gene, mcr-3, has been discovered with much higher variation comparing to mcr-1 and mcr-2 (Xavier et al., 2016; Yin et al., 2017). All three mcr genes could be disseminated through the plasmid, which further facilitates the dissemination of colistin resistance not only in the clinical setting (Wang et al., 2017a), but also widely in the animal husbandry and various environment (Hembach et al., 2017; Huang et al., 2017; Wang et al., 2017b; Zhou et al., 2017). This poses a serious threat to the public health and animal husbandry, and it is urgent to develop a method to detect three mcr genes simultaneously not only in the bacterial culture from clinical samples, but also environment samples. However, the conventional detection method, such as conventional PCR and Sanger sequencing, is time-assuming and labor intensive. It's necessary to develop a rapid multiplex real-time PCR assay to detect the three colistin resistance gene simultaneously. Recently several real-time PCR method for mcr-1 detection has been reported (Bontron et al., 2016; Dona et al., 2017) but none for mcr-2 and mcr-3. Here, we develop a fast, sensitive Real-time PCR method for specific detection of three plasmid-mediated colistin resistances. Primer premier 5.0 software (Biosoft International, Palo Alto, CA) was used to design the specific real-time PCR primers for three colistin resistance genes (mcr-1, mcr-2, mcr-3; Table 1). The sequences of primers were searched against the NCBI database to confirm the specificity of the primers using Primer-BLAST module (https://www.ncbi.nlm.nih.gov/tools/primer-blast/). Conventional PCR was used to evaluate the specificity of the primers. Due to the lacking of mcr-2 carrying isolate in our laboratory, the complete mcr-2 gene was synthetized according to the sequence (GenBank accession no.LT598652). Table 1. 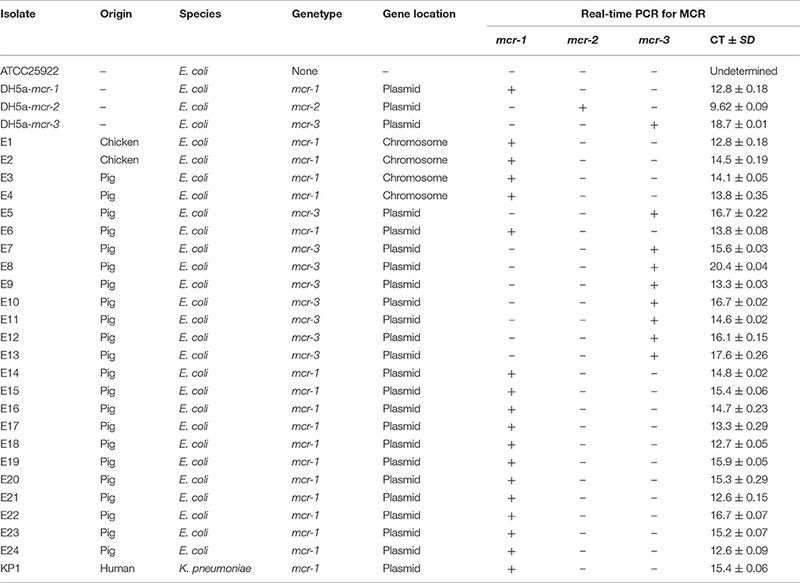 Primers for detection of the mcr-1, mcr-2, and mcr-3 gene. All three mcr genes were cloned into the PMD19-T vector, and then transferred into the DH5a cell. The constructed plasmids were extracted using the PureYield™ Plasmid Midiprep System (Promega) according to the manufactures instruction. 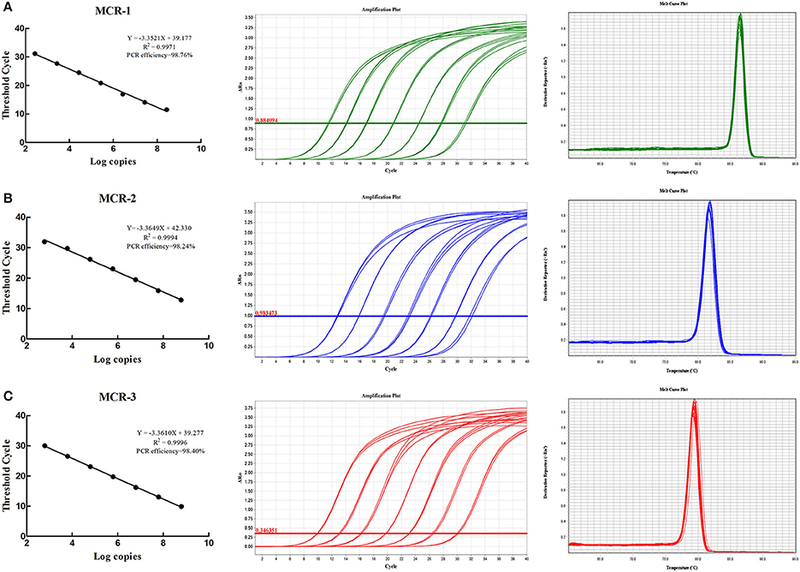 A serial dilution of plasmid DNA concentration was conducted to establish the standard curve using the real-time PCR assay on the QuantStudio™ 7 Flex Real-Time PCR System (Applied Biosystems). The reaction was prepared by mixing the SYBR™ Green master mix (Applied Biosystems) with primers and template plasmid DNA. The real-time PCR condition was programmed as follows: a cycle of 50°C for 2min, 95°C for 3min, then 40 cycles of 95°C for 30s, 60°C for 30s, and 72°C for 30s, followed by a ramp from 72 to 95°C for melting curve stage. Once the primer design finished, all primers were evaluated in silico to confirm the specificity, and there is no other sequences match these primers except mcr-1, mcr-2, and mcr-3 genes, respectively. Moreover, the conventional PCR was used to confirm the specificity of primers, and the results indicated the high specificity of primers (Figure S2). The assay linearity and limit of detection were conducted using a serial dilution of the recombinant plasmids pMCR-1, pMCR-2, pMCR-3 carrying the mcr-1, mcr-2, mcr-3 gene. The detection of copies range was 2.7 × 102~2.7 × 108, 6.1 × 102~6.1 × 108, 6.3 × 102~6.3 × 108 for mcr-1, mcr-2, mcr-3 gene, and Ct (Cycle threshold) range were 31.18~11.50, 32.63~12.82, 30.02~9.90 for mcr-1, mcr-2, mcr-3 genes. All r2 values were >0.997 and all amplification efficiency were >98% (Figure 1). The formula for absolute quantification was shown in Figure 1. Figure 1. Real-time PCR standard curves, amplification curves and melting curves. (A–C) Show real-time PCR standard curves, amplification curves and melting curves for mcr-1, mcr-2, and mcr-3. To validate the method, some E. coli isolates from animal and human origin (Table 2), were selected to conduct the real-time PCR assay for screening. The PowerSoil® DNA Isolation kit (MOBIO, USA) was used to the metagenomic DNA from feces and soil for the validation of methods. The absolute copy number of mcr-1 in the feces and soil samples were quantified by using the standard curve and Ct value. Table 2. Detection of the mcr-1, mcr-2, and mcr-3 gene in isolates. A total of 25 field isolates were selected to evaluate the specificity of the primer. Seventeen mcr-1 positive strains, and eight mcr-3 positive strains of different origins were tested using multiplex real-time PCR assay. E. coli ATCC25922 was used as negative control strain, and three DH-5α strains carrying mcr genes were used as positive control. Three independent technical replicates were applied to each sample. The results of real-time PCR assay showed 100% concordance with previous conventional PCR results. The Ct range were 12.6~16.7, 9.62, 13.3~20.4 for mcr-1, mcr-2, mcr-3 genes (Table 2). The method was also used to further validation to screen the mcr-1 in the feces and soil samples. A total of 20 feces and soil samples (three independent technical replicates) from chicken farm were selected for the evaluation of the method, the real-time PCR assay showed that the copies of mcr-1 gene ranges from 1~105 (normalized using 16s rRNA from 0.25 g dry feces or soil samples) in the metagenomic DNA from feces and soil samples (Figure 2). Figure 2. Detection of mcr-1 gene in soil and feces samples. 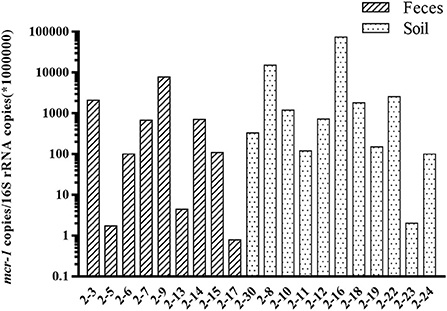 The relative abundance of mcr-1 gene (mcr-1 copies /per 1,000,000 copies of 16S rRNA) in the soil and feces samples. Since the first discovery of mcr-1, multiple variants have been identified with either single nucleotide variation (mcr-1.2~1.7) or relatively less conserved, especially mcr-3. The prevalence of mcr genes is rising very fast in the clinical medicine (Wang et al., 2017a). Thus, the rapid screening methods are required for the detection of these mcr genes. So far, there are two reports about fast screening of mcr-1 using the real-time PCR method, which has been validated using both pure bacteria and the human stool samples (Bontron et al., 2016; Dona et al., 2017). Both reports have approved the effectiveness of the real-time method, but only can be used for the screening of mcr-1. With the growing number of novel mcr gene variants discovered, especially mcr-2 and mcr-3, a multiplex assay is necessary for screening all three types of mcr genes from various samples. The method developed in this study is very effective for the screening of all three mcr genes, not only in the cultured bacteria, but also directly from feces and soil samples. The mcr-1 can be detected as low as 1 copy per 1,000,000 copies of 16s rRNA in the feces samples, and the highest abundance of mcr-1 could reach 105 copies per 1,000,000 copies of 16s rRNA (Figure 2). Relative abundance was the most popular method to measure the abundance of antibiotic resistance genes in the feces and soil samples, as the composition and abundance of microbiome varies a lot among different feces and soil samples (Bontron et al., 2016; Subirats et al., 2017). In this study, both mcr-1 and mcr-3 has been successfully detected in the cultured bacteria from natural animal and environment isolates. However, mcr-2 has not been validated in the cultured bacteria, as lacking mcr-2 carrying bacteria in our lab. The specificity of the primers has been confirmed by both traditional PCR and melting curve analysis. The limitation of this method was all three mcr genes could not be detected in one reaction comparing with the Taqman assay. However, this method does have the flexibility for screening different mcr genes with any combination at relative lower cost, as the co-existence of mcr genes has not been reported in the clinical medicine, and it is not necessary to screen all three mcr genes. Recently, only one case was reported about the co-occurrence of mcr-1 and mcr-3 in one E. coli isolate from cattle farm (Hernández et al., 2017). Also considering the number of novel mcr gene has been growing, the flexible combination of the detection assay does have its advantage. In conclusion, this SYBR Green-based real-time PCR assay is a rapid, sensitive, and highly specific detection assay for the mcr-1, mcr-2, and mcr-3 genes either from cultured bacteria, feces, and soil samples. It is easy to perform in any laboratory having at its disposal a qPCR machine. This rapid technique may be used for the evaluation of the prevalence of this resistance trait in humans and animals (surveillance studies). In addition, it will be a valuable tool for fast screening and quantifying all mcr genes not only in the bacterial, but also in feces and soil samples. Conceived and designed the experiments: SW, YW, ZS. Performed the experiments: JL, XS, WY. Analyzed the data: SW, JL, XS. Wrote the paper: SW, JL, WY, SD. This work was supported in part by the National Key Research and Development Program of China (2016YFD0501301, 2016YFD0501304, 2016YFD0501305), National Key Basic Research Program of China (No. 2013CB127200) and the National Natural Science Foundation of China (81661138002). Figure S1. Multiple sequence alignment of mcr-1 variants. Figure S2. Conventional PCR amplification and real-time PCR melting curve for mcr genes. (A–C) were the electrophoresis gel (left) and melting curve (right) of mcr-1, mcr-2, and mcr-3. M: Marker. NTC: negative control. 1A, 1B, 1C, 1D were mcr-1 positive strains. 2A was mcr-2 positive strain. 3A, 3B, 3C, 3D were mcr-3 positive strains. 1A, 2A, 3A were identical templates in this figure. 2B, 2C, 2D were negative strains. Copyright © 2017 Li, Shi, Yin, Wang, Shen, Ding and Wang. This is an open-access article distributed under the terms of the Creative Commons Attribution License (CC BY). The use, distribution or reproduction in other forums is permitted, provided the original author(s) or licensor are credited and that the original publication in this journal is cited, in accordance with accepted academic practice. No use, distribution or reproduction is permitted which does not comply with these terms.